Antique - Thomas Forester & Sons, Phoenix Ware Tea Set in the "Blue Imari" Pattern, Made in 1912 to 1925, 21 Pieces. This is a sought after but very hard to find Pattern, by Thomas Forester & Son of Phoenix Ware China. A 21 Piece Tea Set, Service for (6) Six, in the "Blue Imari" pattern, was made during the Art Nouveau/Edwardian Period. A Striking White China with the Imari Design in Blue/Black/Sepia/Rust and Green. All items have 22kt Gold Rims, Feet, Handles and the inside of the Cups also have the Pattern Motif. This is a sought after but very hard to find Pattern, by Thomas Forester & Son of Phoenix Ware China. 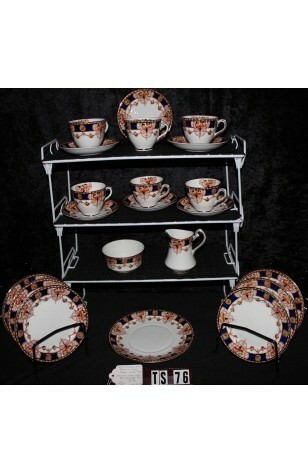 A 21 Piece Set, Service for (6) Six, in the "Blue Imari" pattern, was made during the Art Nouveau/Edwardian Period. A Striking White China with the Imari Design in Blue/Black/Sepia/Rust and Green. All items have 22kt Gold Rims, Feet, Handles and the inside of the Cups also have the Pattern Motif. In Great Resale Condition unless noted below or in pictures. 6 - Saucers - 5 1/2"